What is dengue fever? You'll survive if you get it, but your trip plans probably won't. Now endemic throughout Asia, Africa, and Latin America, dengue fever is a mosquito-borne illness caused by a virus. It is a leading cause of death and hospitalization of children in tropical and sub-tropical countries. Dengue fever has risen dramatically in the last decade, even making appearances in the U.S. and Europe. The World Health Organization estimates that around half of the world's population is now at risk from dengue fever, but no one knows exactly how many cases there are annually. Estimates range widely with 50 – 528 million people thought to be infected with dengue fever per year. As a traveler in Asia, particularly Southeast Asia, you are at risk for contracting dengue fever from mosquito bites. Dengue fever is typically spread through mosquito bites received during daylight hours. The vaccine for dengue fever isn't completely reliable and is not yet recommended for travelers. Dengue is typically not fatal, however, victims sometimes end up hospitalized or sick for weeks. Dengue fever is much more risky the second time you contract it. Five different strains of the virus exist; you can typically only get each strain once. Although you'll hear several variants for pronouncing dengue fever, the correct way sounds like "den-gay." Dengue is a Spanish word. Dengue fever, sometimes called breakbone fever, is a mosquito-borne illness caused by the dengue virus transmitted by the Aedes aegypti mosquito. When an infected mosquito bites someone whom is already suffering from dengue fever, she carries the virus on to her next victim. Dengue fever is not transmitted directly from human to human, however, one mosquito can infect many people within her life cycle. You are more at risk for contracting dengue when other people infected with dengue are present. Blood transfusions have been known to spread dengue in rare instances. Although typically survivable, dengue fever can put you out of commission for weeks and feeling drained for a month or longer, certainly long enough to put a damper on your fun in Asia! Only female mosquitoes from the genus Aedes can transmit dengue fever. 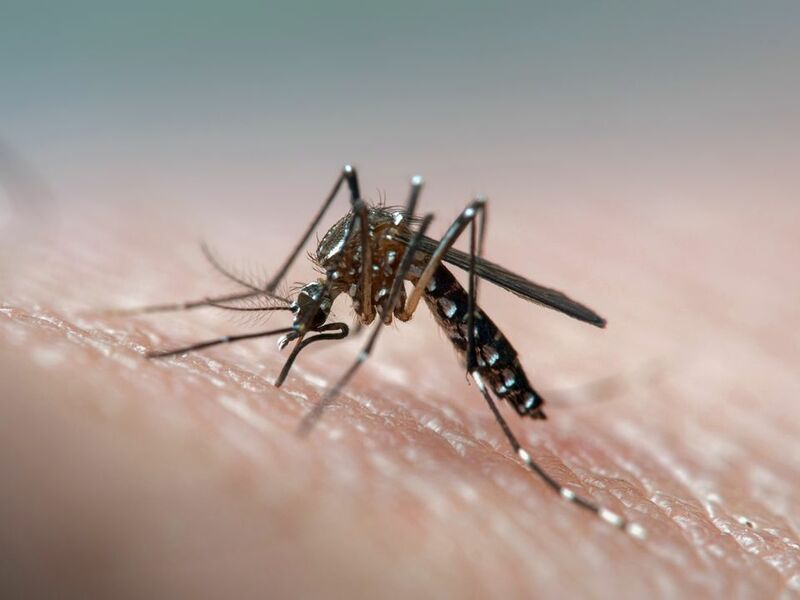 The main culprit is the Aedes aegypti mosquito or "tiger mosquito" which is larger than other mosquitoes and has white spots and markings along the body and legs. These mosquitoes mostly breed in stagnant water sitting in man-made containers (e.g., empty flower pots and buckets) in urban environments. The aedes aegypti mosquito prefers to feed off of humans and thrives more around human settlements (towns and cities) than in the jungles. Unlike the mosquitoes that transmit malaria, dengue-infected mosquitoes typically bite during the day, particularly at dusk. Protecting yourself from bites in the early morning and late evening just before dusk is essential to avoid potential exposure to dengue fever. Cover skin and frequently reapply DEET to prevent mosquito bites. Basically, you limit your exposure to dengue by reducing the number of mosquito bites you receive on your trip. The first symptoms of dengue fever start to appear from 3 – 14 days after a bite from an infected mosquito. Symptoms can differ in severity for different people. As with many viruses, early symptoms of dengue fever begin with flu-like aches and pains — particularly in the joints — and a severe headache accompanied by high fever (104 degrees Fahrenheit / 40 degrees Celsius). The aches and pains are usually followed by swollen glands, nausea, and vomiting. Even when dengue doesn't turn severe, it can produce fatigue for weeks after exposure. Sometimes patients report severe eye pain. Because dengue fever symptoms are flu-like and fairly common, a combination of two or more (the rash is often an important indicator) are needed to make a potential diagnoses. Rash, red spots, blotches on skin. The discolored skin blanches when pressed during the acute stage. White spots surrounded by red skin are common. Signs that dengue fever has produced complications and may have become potentially life threatening include: severe abdominal pain, vomiting blood, bleeding from mucous membranes, and rapid/shallow breathing. People with asthma and diabetes are at a higher risk for developing dangerous complications from dengue. Around half a million people require hospitalization from severe dengue each year and about 2.5 percent of those cases prove fatal. Young children in developing countries are most often the victims of dengue fever. People who are unlucky enough to get dengue fever (a different variant) a second time have a much higher risk for complications and dangerous health implications. Unfortunately, there is no official or sure-fire way to treat dengue fever; you simply have to ride it out over time. Dengue treatments include basics such as giving over-the-counter medications to control fever, fluids to stop dehydration, and close monitoring to ensure the virus does not cause hemorrhaging. Important: People who think they have dengue should never take ibuprofen, naproxin, or aspirin-containing drugs; these can cause additional bleeding. The CDC recommends taking only acetaminophen (branded as Tylenol in the U.S.) for pain and fever control. Dengue hemorrhagic fever appeared in Thailand and the Philippines in the 1950s. Only nine countries were thought to have dengue epidemics before 1970. Today, dengue is considered endemic in more than 100 countries with Southeast Asia being the worst affected region. Dengue was spread significantly during World War II. Unlike Japanese encephalitis and malaria, you have more risk for contracting dengue fever in urban areas such as Pai and Chiang Mai than in rural areas. Dengue is also a real problem in the Thai islands. Places such as Railay, Thailand, have plenty of porous rocks and wet areas where water collects and mosquitoes can breed uninhibited. Much of the southeast United States is now at risk for dengue fever; 24 cases were reported in Florida during a 2010 outbreak. Dengue has also been prevalent in Oklahoma and along the border with Mexico in southern parts of Texas. Climate change has been blamed for the jump in dengue cases as well as the mosquitoes' ability to adapt. Some varieties of the Aedes aegypti mosquito have adapted to the cooler climates found in Europe and the U.S. The World Health Organization and Centers for Disease Control and Prevention carefully monitor the spread of dengue. Although a tentative vaccination for dengue fever became partially available in 2016, the manufacturer only recommends getting vaccinated if you've already been infected with dengue once. The current vaccine for dengue fever costs around US $200 and requires three injections spread over time. Human trials are still in progress, and hundreds of thousands of children in the Philippines were vaccinated. The vaccine is thought to be only around 60 percent effective. What is the Zika Virus and Should You Be Concerned? What's the Safest Mode of Travel? Should You Change Your Family Vacation Plans Because of the Zika Virus?